Spring has me thinking Dutch genealogy research. Maybe it’s all the tulips I have been seeing! Researching genealogy in the Netherlands has been one of the most enjoyable learning experiences I have had. Their records are amazing! Here is a quick overview for the beginner on doing genealogy research in the Netherlands. Did you know that according to the U.S. Federal Census for 2000, over 5 million Americans claimed all or part Dutch heritage? Dutch immigration to the United States numbered about 200 people per year prior to 1845 at the start of the Great Famine. The Great Famine, which is sometimes called the Potato Famine, was not only felt in Ireland, but all over Europe and lasted until 1852. Also during this time, religious and economic discontent more than doubled that number putting the average between 800 and 1,500 annually for the next 10 years. After WWII, the Netherlands was the most densely populated country in the world. It was for this reason the Dutch government encouraged their people to immigrate to the US, which increased the growth of the Dutch communities here. First, if you are interested in researching in the Netherlands, I would suggest beginning by reading about it at the FamilySearch wiki. The Netherlands is broken down into twelve provinces. Those provinces are Drenthe, Flevoland, Fryslan or Friesland, Gelderland, Groningen, Limburg, Noord-Brabant, Noord-Holland, Overijssel, Utrecht, Zeeland, and Zuid-Holland. Each of the provinces are then broken down even further into municipalities. It is on this level that many vital records exist. If your ancestor immigrated to the U.S., it is important to find some record that would indicate which province and municipality your targeted ancestor was born, lived, or died in. You might find that on a U.S. death record, a census, a biography, obituary, American military service record, or a naturalization record. 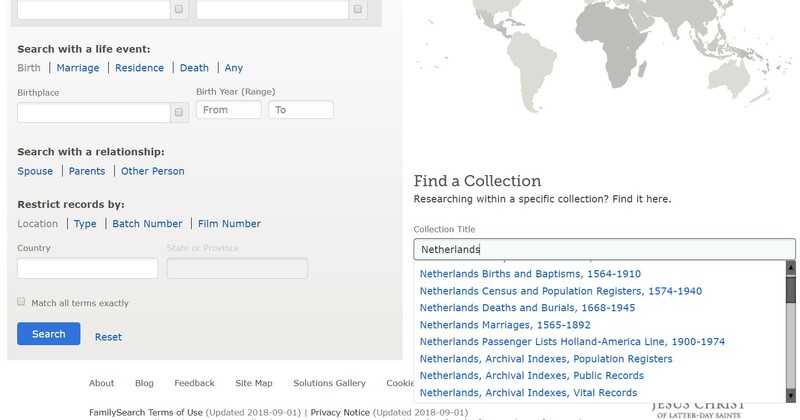 When you are ready to dive into record research in the Netherlands, pop over to FamilySearch.org. Be sure to log in. Then, click “Records” from the options across the top. Scroll down a bit and in the “Find a Collection” field at the bottom right, begin typing “Netherlands.” You will see a list of titles. These are the titles to record collections of indexes and digital images. This is when knowing your ancestor’s place of residence comes in handy! 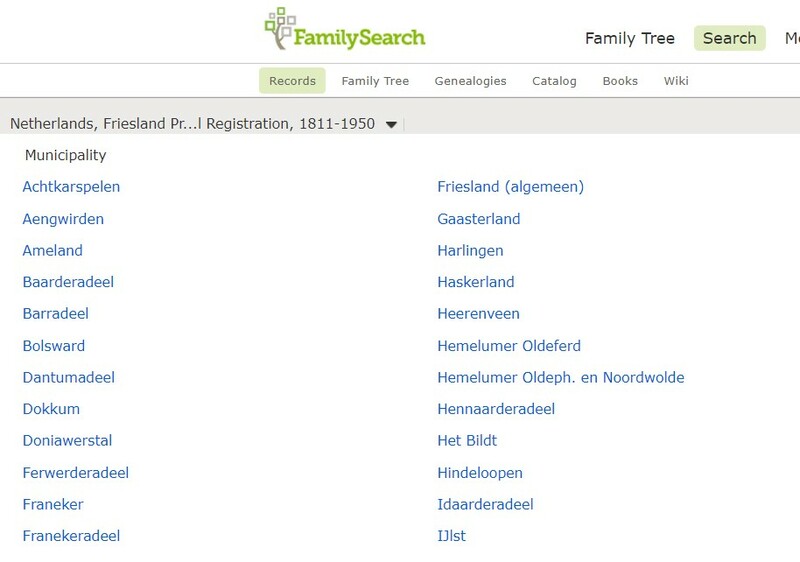 In this example of the collection titled “Netherlands, Friesland Province, Civil Registration, 1811-1950,” it looks like you will need to browse over 3 million records, but don’t worry. When you click the link, you will be directed to filter down the images by municipality and time frame. You don’t speak Dutch? Neither do I, but that is not a problem! By using Google Translate, you can quickly translate the Dutch to English. And, here’s a handy cheat sheet for the Dutch language found at FamilySearch. One thing that seems unique to the Dutch records is the fact that marriage records contain death records. Let me explain. In my case, I was researching in Zeeland province, Kapelle municipality. Marriage records available online for that location included marriage declarations and marriage records between 1811-1922. When I began looking closely at these digital images, I noticed that if the bride or groom’s parent or parents were deceased, they provided the death date and location of death of that parent. Isn’t that wonderful? With that information, you could easily locate the digital image of the death record! Marriage records sometimes had several pages. This would depend on whether the groom or bride had a deceased parent. If they did, there would be more pages in their record. So, if you are looking at marriage records, make sure you remember to “turn the page” so you see all the pages included in the record. Need More Help Doing Dutch Genealogy Research? This was just a brief look at Dutch genealogy research. 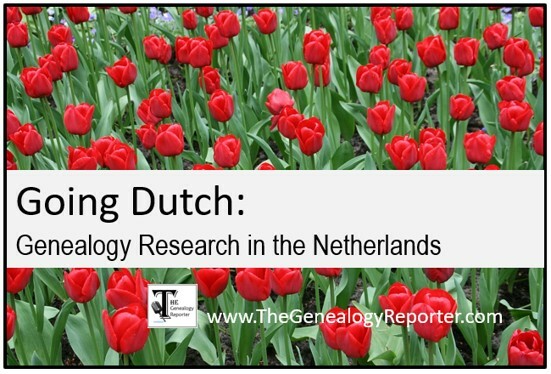 If you have Dutch ancestry, I would highly suggest you watch the terrific webinar titled “Researching Your Dutch Ancestors” by Yvette Hoitink, CG. If you have a subscription to Family Tree Webinars, it can be watched there for free. If you are not a subscriber, you can make a one-time purchase and watch the webinar. In my opinion, well worth it! 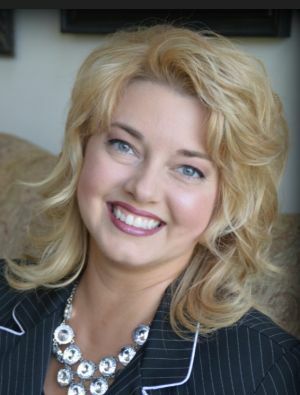 The Genealogy Reporter has an affiliate relationship with Family Tree Webinars. Clicking on links in this blog post may result in a small commission being paid to The Genealogy Reporter at no additional cost to you.